Kuribo’s Shoe. You are my favorite random game thing of old. Kuribo’s Shoe. You are a strange and amazing sight to behold. until the power you had over Spinies and Munchers you showed us. Mario must’nt have felt this powerful (or surreal) since he first beat Donkey Kong. 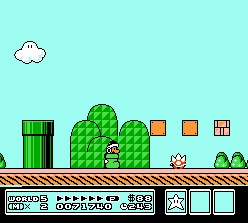 But to top this greatness all off, you let Mario keep his other powers. 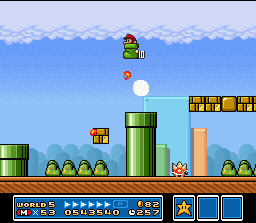 Imagine koopas seeing this hopping deathball coming with fire flowers. Or worse.. or much, much worse. I committed pre-meditated Grand Theft Shoe. 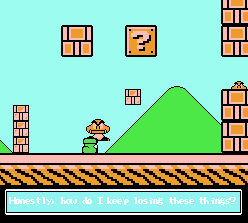 So, what, was that goomba trashpicking from World Four giant river-dancers? No seriously, where’d these things come from? only to return forever, after the end of your stage, from whence you came. 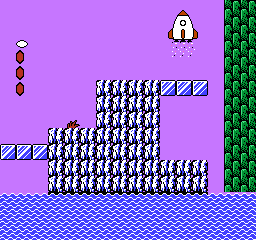 as the rocketship teleport plant from Mario’s previous adventure. Oh man, something else I forgot that I inexplicably loved! Perhaps my fondness comes from how little we saw of you. 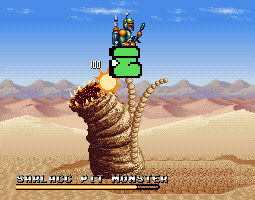 and this obscurity makes you more fun for us fans of 8-bit. Kuribo’s Hipster Shoe: You’ve Probably Never Heard Of It. 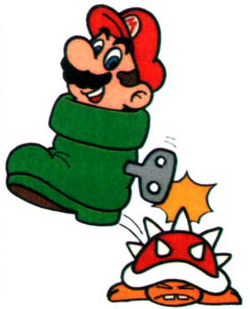 And then the Super Mario All-Stars remake came out and Kuribo’s Shoe became all mainstream..
a small little trinket in which Mario fans can revel. How do you think Boba Fett became famous, despite not doing anything? is that Mario could’ve beat World 5-3 without you — your inclusion wasn’t even needed. So what does that tell us? Why were you programmed, what was your reason for being? Doubtless, you were an act of random inspiration: From the shackles of predictability you were freeing. by the risk-averse committees that can’t afford unprofitable games, a formula-driven collusion. Kuribo’s Shoe. You are wonderfully random in the utmost. Kuribo’s Shoe: You are as crazy and as nonsense as this blog post.